Prayers and Songs will be followed by the traditional auction of produce which has been donated by the locals. 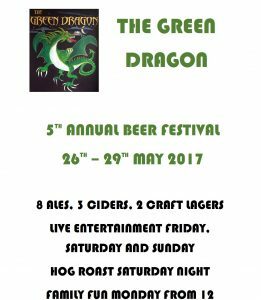 If anyone has anything they have that we could auction please could they deliver it to The Green Dragon by the 6th October. All monies raised will be given to the church. Time to tickle those grey cells and put Edwin the Quirky Quiz Master to the test. We will be holding a Halloween Party with a Free BBQ (yes I said free) and yes there is a catch. Gareth and Geoff have decided to venture into the world of Food Development (sounds posh doesn’t it) and as a result they are looking for some willing victims (sorry meant volunteers) to try their new recipe burgers and sausages. All you need to do to qualify is buy a pint or glass of wine from the bar and you will get a raffle ticket which will entitle you to your free food. You will then be asked to provide honest feedback to the guys. Oh and we will be having ghostly party games so please dress accordingly as it could get messy !!!!! The lovely Julie will be once again be using her skills to make contact with friends and relatives from the other side. Tickets Cost £8.00 each to include nibbles and a glass of wine. Seats are limited to 24 so please book early to avoid disappointment, full payment will be required at time of booking. As before Julie will also perform individual readings these will last 15/20 minutes and will cost £15. 3 Joints of delicious meat up for grabs. Monday 1st of July to Sunday 7th sees an exciting American Theme to our menu to celebrate Independence Day along with our American cousins across the pond. How about a huge sharing platter of ribs, chicken, corn fritters, loaded potato skins, coleslaw and dips, and an American drink each for a fantastic £20 for 2. Or a whopping burger, crispy bacon & cheese, fries and onion rings for only £9.95. Then choose a yummy American themed dessert from the board for only £4.50. Do you like Wine ? (lets face it who doesn’t) but don’t know your Chardonnay from your Pinot! Well why not let us entertain you with a Wine Tasting evening. Steve from AMPS Fine Wines will be visiting the Green Dragon to show off his fine selection of Wines from around the world, you will be given expert tuition in how to choose the right wine to go with the right food. There will also be a selection of Fine Wines to order at a very reasonable price. Come on you know you want to ?? Join us at the Green Dragon at 9.00am for a Full English Breakfast (essential for the days drinking to follow) then jump on the mini bus for a quick trip to Greene King Brewery where you will get to see how their finest ales are brewed. The cost of the ticket includes Full English Breakfast, Brewery Tour, Lunch, Mini Bus Hire, liquid refreshments to drink there and back plus 2 Ibuprofen for the following day.